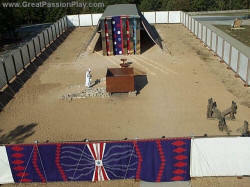 The Bible text about the Tabernacle courtyard is Exodus 27:9-19. The courtyard was some 100 cubits (approx 150 feet) long by 50 cubits (75 feet) wide. It was surrounded by white linen curtains hung from wooden posts. The wooden posts had heavy bronze or copper bases with silver tops. The posts had silver bands and hooks on them to hang the curtains. The height of these curtain walls was about the height of a man of that time. The posts were held in place by ropes tied to bronze pegs in the ground. The entrance to the courtyard was made of linen embroidered with scarlet, blue and purple. Most models make the curtain of one solid piece of cloth several hundred feet long. 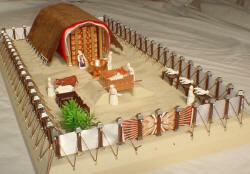 While this makes it easy to make in a model, it doesn't seem likely to us in a full sized Tabernacle. For practical purposes we envision that the between each post was a separate curtain. A single curtain extending some several hundred feet long would not have been practical. Such a curtain would have been very difficult to handle and erect without getting damaged or dirtied. When damaged it would have been hard to fix. When soiled it would have been hard to clean. Separate curtains would have met the requirements. Left is a picture of the item as envisioned by the folks at "The Great Passion Play" who built a full scale model of the Tabernacle. This is NOT from our 3D model. You can use this image for comparison to the 3D concept. Each part is identified by a number and is explained on a reproducible worksheet on the back of the chart. 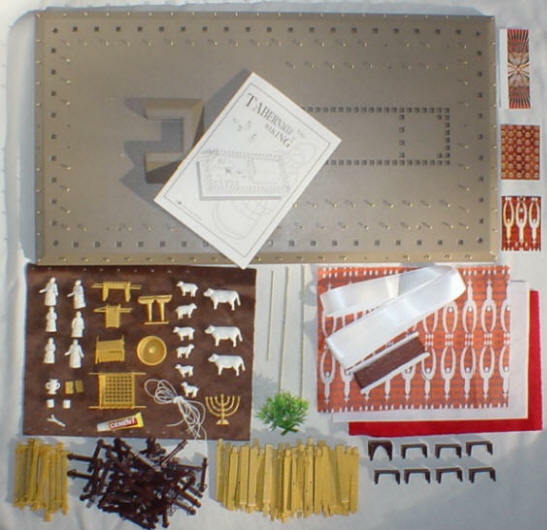 Descriptions of each item include scripture references. Laminated. 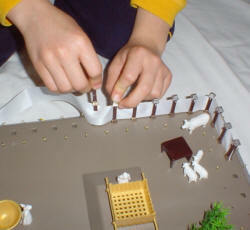 19.5" x 26"
What was the purpose of the tabernacle? What did it look like? 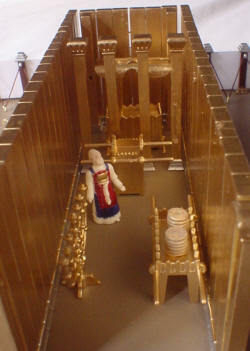 What is the relationship between the tabernacle and the temple? What finally happened to the Ark of the Covenant? Has the tabernacle any significance for the Christian today? All these questions--and more--are answered in this fascinating and detailed description and history of the wilderness tabernacle. Illustrated with full-colored photographs of two recent replicas of the tabernacle, this guidebook offers the reader an engaging look at this extraordinary tent and how it functioned.